Martin Luther King Jr., was a powerful and eloquent champion of the poor and oppressed in the US, and at the height of his fame in the mid-'60s seemed to offer the real possibility of a new and radical beginning for liberal politics in the USA. However, in 1968, he was assassinated; the movement for social and economic change has never recovered. The conviction of James Earl Ray for his murder has never looked even remotely safe, and when William Pepper began to investigate the case it was the start of a 25-year campaign for justice. At a civil trial in 1999, supported by the King family, 70 witnesses under oath set out the details of the conspiracy Pepper had unearthed: the jury took just one hour to find that Ray was not responsible for the assassination, that a wide-ranging conspiracy existed, and that government agents were involved. An Act of State lays out the extraordinary facts of the King story - of the huge groundswell of optimism engendered by his charismatic radicalism, of how plans for his execution were laid at the very heart of government and the military, and of the disinformation and media cover-ups that followed every attempt to search out the truth. 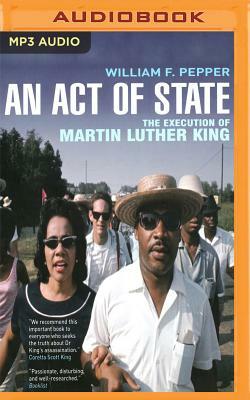 As shocking as it is tragic, An Act of State remains the most compelling and authoritative account of how King's challenge to the US establishment led inexorably to his murder.